The bit of low-hanging fruit that really jumps out is a fully protected bicycle route using the existing park/alley between Wentworth and Lottridge Streets. This article is based on an analysis of Barton Street done for the Barton Village Business Improvement Area. This Area extends along Barton Street from Ferguson Avenue to Sherman Avenue. This is a preliminary report based upon my own estimations of street width and geometry. The BIA is in the process of obtaining surveyed dimensions of the road allowance. This analysis may change upon receipt of this survey data. Upgrade the parallel alley immediately north of Barton between Wentworth Street and Lottridge Street for the purpose of being a protected bicycle route. Install New York-style car parking protected bicycle lanes on Barton Street. Install conventional protected bicycle lanes on Barton Street. No further description, since we can go and see the status quo right now. Right now there exists an alley immediately north of Barton between Wentworth Street and Lottridge Street. This includes the bicycle path through Woodlands Park for a total distance of 1.3 km. Although currently neglected, this has the potential to be a high-quality protected cycle route. Very few potential users of this cycle route are even aware that it exists. Recommendation: Street signs and inclusion of the route on the Hamilton Bike Map. There are three types of safety that are required to achieve a high cycle transportation mode share. These are actual safety, subjective safety and social safety. As a fully protected, almost car-free cycle route, this alley can have a high degree of actual and subjective safety. For social safety, I recommend cleaning up the alley. Remove graffiti, garbage and vegetation. Repair or replace defective or non-existent paving. Install street lighting for illumination at night. Here is a photograph of an example of an alley that has been cleaned up and has acceptable social safety. Note the position of the street light. This places light right where it is needed. 63.5 percent of injury causing crashes in Ontario take place at intersections. So intersection safety is important. Where the alley crosses local residential streets, bicycle traffic should be given priority. This should be done at Myler Street, Westinghouse Avenue, Milton Avenue, Fullerton Avenue, Earl Street, Ruth Street, and Barnesdale Avenue. The correct method of doing this is in accordance with the CROW Bicycle Traffic Design Engineering standard, which is described in my article on the Pipeline Trail in the section entitled "Safe Intersection Design for Children and Everyone Else." Using the ally has the following advantages and disadvantages. It is cheap. The most expensive part of creating protected cycle routes is usually acquiring the land for them. In this case, that already exists. Intersecting alleys create a network. There are five north-south alleys that connect in mid-block to the east-west alley we are considering between Wentworth Street and Lottridge Street. This creates an extensive protected network to take local customers directly to businesses on Barton Street. It is safe. The high degree of safety on this protected route makes it very attractive to use. No impact on other Barton road users. Since this route is not on Barton itself, there is no requirement to change the existing layout of Barton Street and zero impact on other users of Barton. Reduces congestion on Barton. By taking traffic off Barton, this reduces congestion on Barton Street. Avoids traffic lights. This route bypasses the traffic lights at Birch and Sherman, making for a faster travel time. Slight detour at 601 Barton Street. This is the former school being converted to a condominium. It will be necessary to upgrade the sidewalk in front to a Multi-Use Path. An example of this in Hamilton may be found on Burlington Street, between Gage Avenue and Ottawa Street. This is low-hanging fruit that is a cheap and easy way of benefiting this part of Barton Street. However, it only benefits this one specific part of Barton, so other cycling infrastructure upgrades on the entire length of Barton itself need to be considered. The Taming and Reclaiming of Prospect Park West from STREETFILMS on Vimeo. It is cheap. This is, literally, paint. Probably the most expensive part of the project would be removing the existing bump-outs. It preserves car parking. Many people would disagree that this is an advantage, since they consider the presence of cars and the lethal poisons in car pollution to be hostile to a vibrant, healthy and prosperous street life. It extends the entire length of Barton. The entire street can benefit from this intervention. It is safe. Narrowing car travel and parking lanes to create the bike lanes has the effect of slowing car traffic. The safety benefits that New York achieved are also achievable here in Hamilton. Pedestrians are protected. This treatment keeps pedestrians safe by providing an extra buffer zone to protect them from car drivers. Safe bus stops. This design allows for safe bus stops with cyclists passing behind bus passenger waiting areas. See this description and video for examples. Lower level of protection than conventional protected bike lane. If car drivers are not currently parking cars next to the lane, then there is no protection. Poor aesthetics. Parked cars can be quite ugly. Although most people can see over parked cars while cycling, they can block the view of the street for children or shorter people. The next alternative is that of a conventional protected cycle lane. An example is on Cannon Street. However, since Barton is a two-way street, it is appropriate to have cycle lanes on each side of the street. Here is a video and description of how a street that was similar to Barton Street had protected cycle lanes installed. The street in the video is about the same width as Barton Street and is also a commercial/shopping street. The infrastructure improvements have worked out very well. Cheap. The most expensive element is the protective barriers. Typically this ranges from flower beds to bicycle parking. Excellent safety. Conventional protected bicycle lanes have a proven track record for safety. There is excellent subjective safety; people feel safe. Commercial revitalization. Conventional protected bicycle lanes can revitalize commercial/shopping streets by making them an attractive place to be in, shop at and travel through. Safe bus stops. See this video for several examples of safe bus stops with conventional protected cycle lanes. Car parking relocated. If any car parking is to be provided, this design prevents it being on Barton Street itself. Change is hard for some people. In 1932, Groucho Marx did an excellent job of describing the reaction of some people. This analysis remains true today. The bit of low-hanging fruit that really jumps out is a fully protected bicycle route using the existing park/alley between Wentworth and Lottridge Streets. Many cities have spent large sums of money to acquire property to construct this sort of protected bicycle route. We are fortunate enough to have the property already. We just need to use it instead of wasting it. 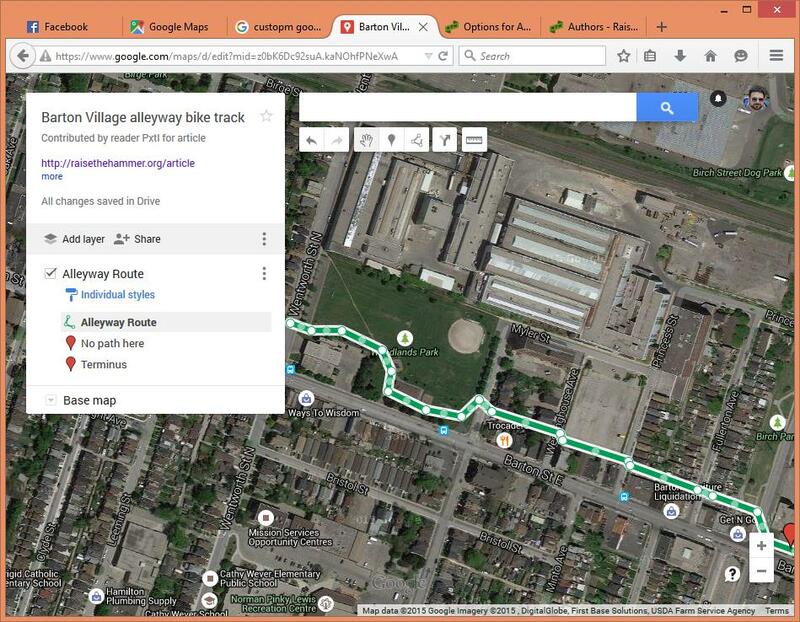 Update: updated to add the Google Map of the alleyway route that RTH reader Pxtl was kind enough to share in the comments. You can jump to the added map. Since I was confused about the alleyway, I created a map for you all. ryan has been marked as editor, I'd mark Kevin too but I didn't have an email for Kevin Love. Thanks for creating and sharing this! I've added an embed to the article. You can jump to it to see what I mean. I think the alley path could be extended beyond the Gibson School (I think now is being converted to condos?) all the way to Lottridge (close to Gage) and beyond. If a right of way could be negotiated around the front of the building along Barton the alley continues to Lottridge for an additional ~800m. From there it would have to hop back on to Barton to Ottawa. That's a great work of art. Thanks! It is really truly a low-lying apple. The chief problem is visibilty, so signage needs to be really good (Maybe a nickname such as "BartonTrak" or whatnot), and with good marking, as well as good crossing markings. And it needs to be connected to bike lanes/infrastructure at the endpoints where alleys don't continue. Well, imho the real problem is it stops too short - if it was going Victoria to Ottawa, it would be a fantastic connection - Victoria's existing bike-lane could be expanded. Without that it would just be a little isolated local thing. It's a shame - you poke around the map and there are remnants of continuations of the alleyway from Victoria to Ottawa, but most of the way is gone and so it would be impossible to rebuild. That said, an isolated local bike-lane isnt' always a bad thing since it would allow cyclists access to the Barton village in that area. Yes, agreed. I ride from the North End fairly regularly to Ottawa Street and there are no direct or straight routes. You end up either going up to the Cannon Bike Track and then heading North to use residential streets to get to Beechwood behind the stadium after Sherman and head back south to Primrose get around a factory and thru Belview Park to access Campbell Ave, which runs to Ottawa Street just south of Barton, or wind thru Keith past the old Studebaker/Otis Elevator site, slightly north at Wentworth to Brant St and then south (the wrong-way on Sherman ... use of sidewalk recommended) to Biggar Ave and Beach Road, which dumps you on Ottawa just north of the CN mainline. I typically use the former to access shops on Ottawa Street between Barton and Cannon/Roxborough, and the latter when I need something from the Centre on Barton. Neither is ideal and took me several trips to figure out and get comfortable with. Personally, I'd recommend against cycling on Beach Road as it seldom feels safe given the narrowness, parked cars, driveways, and generally high-speed of cars on it, etc. But you don't have many options as you go east of Sherman south of the rail-corridor, especially past Gage. I would welcome any improvements in connectivity for cycling that reduce the number of jogs and backtracking required for this sort of cross-town trip. Kevin, I disagree with a lot of what you say, but I think this is a great idea. Helps cyclists, but is of minimal impact to drivers. I'd like to see this become a reality. His real name is K. Somers. One thing I REALLY would like to see more of in Hamilton -- is green bike paint for better clarity. Just a few token signs on a signpost, doesn't make a bike path. So if we make a path through hard-to-beautify alleys (it would literally take a decade to gradually prettyify on the cheap), then let's make it a beautifully clear bike path on the alley asphalt/concrete. The rest can come later (a small bit of opt-in citizen backyard landscaping, improved city lighting (that points downwards and not bothering sleeping people at the house windows), a garage improvement there, a gravel mess cleanup over there, then it all becomes a more attractive alley over time. So to begin, let's beautifully paint a very clear 1.5 meter "bikes welcome" green path through the alley. Fantastic idea. But protected bike lanes in an alley way? I don't think it's too conclusive of an idea for the area. I live in the area, cycle everyday, been here all my life and would never use it. Between Gage Street and Sherman Avenue, if I'm going westerly it's more than likely I would be taking Beechwood Avenue to Sherman Avenue, cutting into the long stretch of alley that goes from Sherman Ave. to Birch Ave., continuing onto Harvey St. to Sanford Ave.. Since the Cannon Bike Lanes, going westerly I usually proceed onto Beechwood to Sherman, ride south to just after Rosemont either take a partial alleyway trip(west), then south to the Cannon Bike Lanes on a side street, or go against the traffic from Beechwood to Cannon, on Sherman depending if it's busy or not to make my way to the Cannon Lanes. Going easterly, I ride on Beechwood Ave. to Balsam Ave., up to the Cannon Bike Lanes and proceed when needed. What I can see is, if the protected bike lanes are implemented in the alleyway, it may or may not be good for the businesses along the Barton BIA. One would figure the businesses in that area would use the area for transportation/ delivery of goods. Bicycles competing with commercial and regular vehicles going in and out of the alley. Whether going east or west, the Cannon Lanes are always the option because I live close to Cannon Street, but closer to Beechwood. If the protected bike lanes were implemented in the alleyway below Barton, I would not use them. What I would like to see is more road work/ bike lanes going easterly from Gage Ave And Ottawa Street, on Cannon Street East onto Britannia Ave. to Strathearne Ave. Or continuing to Parkdale. Prior to Bike Lanes and BIAs and committing to a long ride, I always used Cumberland as my bike track to get downtown because it was(is) one of the smoothest rides in the city. It connected me to downtown via rail trail going westerly(yes riding uphill on wentworth to the rail trail). Or, if going easterly, south on Gage cutting through Gage Park to Lawrence Road and taking Lawrence Road easterly. A little dangerous but it connected me to Redhill/ Rosedale area trails. After the Redhill Expressway went in, I rode it sparsely.